There is nothing peskier when finishing up planting new flowers or shrubs than having to go back through and pull weeds from the landscape beds. The nuisance of landscape bed weeds can be unsightly as well as damaging to the plants and shrubs that you are trying to grow. Luckily, there are a few things that can be done to ease the burden of these landscape weeds and possibly prevent them all together. One of the easiest ways to combat weeds within landscape beds is to install mulch or other filler item such as rock. 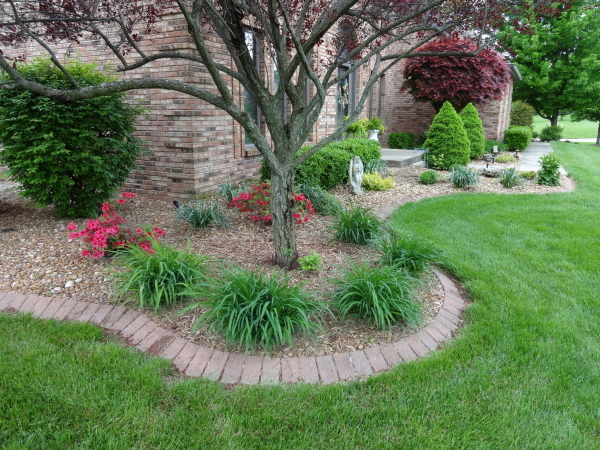 Landscape mulch has multiple benefits to protect and promote the life of the plants within the beds, as well as add color and protect your home. When installed properly, landscape mulch will keep landscape weeds at a minimum or possibly keep them out all together. Landscape bed weed control is the process of spraying landscaping weeds with an herbicide to kill them. The process typically includes spraying existing weeds with the herbicide as well as applying a granular pre-emergent that helps to prevent weeds from germinating. This application process is usually repeated several times each year and has a great success rate. Pulling landscape weeds can be effective and damaging at the same time. Many times when pulling weeds, the entire root is not pulled as well, this could result in the weed living on and allows it to continue growing. Some weeds also have a very strong and thick root system and when that root system is pulled, it may disturb other plants within the landscaping. When pulling weeds, it is important to take your time and pull them carefully. Landscape weeds are troublesome and can cause the most beautiful landscaping to lose its vigor. A few solutions are available to assist in the battle against weeds, but when all of the solutions are used in conjunction with each other, the results can be outstanding and allow your landscape beds to be the talk of the neighborhood.